Going into the National Gallery of London, the first thing that draws your attention is the mosaic work at the main entrance. 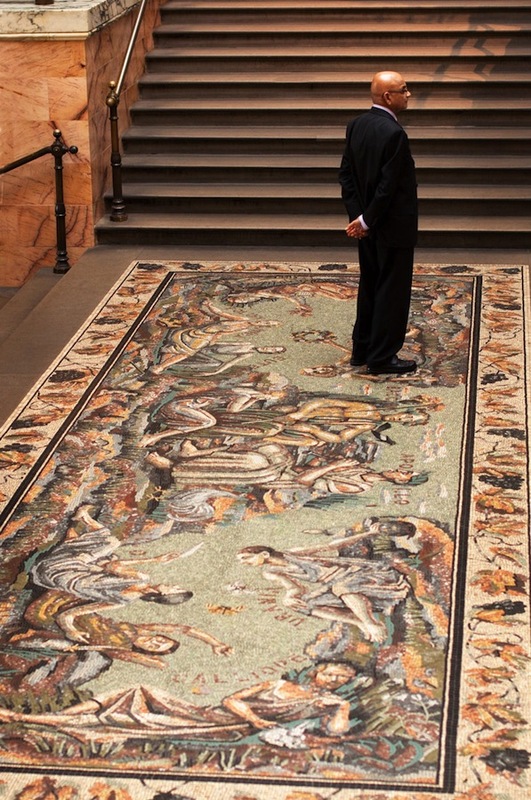 “The Awakening of the Muses’ is a marble mosaic pavement by the Russian-born artist Boris Anrep that welcomes the gallery’s visitors with style. This mosaic, in addition to three other pavements, were laid by Anrep between 1926 and 1952, as commissioned by the Gallery. The Labours of Life (1928), The Pleasures of Life (1929), The Awakening of the Muses (1933) and Modern Virtues (1952) are fabulous images that beautifully reflect Byzantine aesthetics. Arnep’s mosaics adorn many chapels and cathedrals around the world, and are mainly inspired by the Byzantine style. Anrep was one of the foremost mosaicists in Britain, but also a famous poet and intellectual figure, both in Russia and London.